Kosovrasti spa is located east of Debar at the distance of 8 km, at the height of 550 meters above the sea level, near the Dolno Kosovrasti village. The mineral waters of this spa-resort in many small waterfalls and through numerous rocks used to flow into the river Radika. Today, at the same location the power plant Spilje has been built, situated on the shore of the Debar Lake. Apart from the Kosovrasti spa services, it offers the visitors the opportunity to enjoy the lake's beaches and the landscape of the striking valley of one of the most beautiful rivers in Macedonia - the Radika. 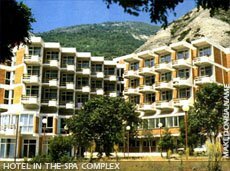 The thermal-mineral water in Kosovrasti spa, owing to the large quantity of sulfur, (in fact the highest level in Europe), and the high radioactivity of 33,79 moch units helps in the treatment of a wide range of diseases, like the spa-resort at Banjiste. At Kosovrasti spa (Kosovraska banja) there is a centre for rheumatism and medical rehabilitation. The Kosovrasti spa accomodation is high 2nd class and possesses the most modern devices and facilities for all kinds of therapy in the field of rheumatology, rehabilitation and physical medicine. The Kosovrasti spa possesses all kinds of expert personnel for diagnosis and therapy. Kosovrasti spa has a high level of cooperation between this centre and other similar institutions in Macedonia.